Did North Korea Test A 'Miniature' Nuclear Bomb? 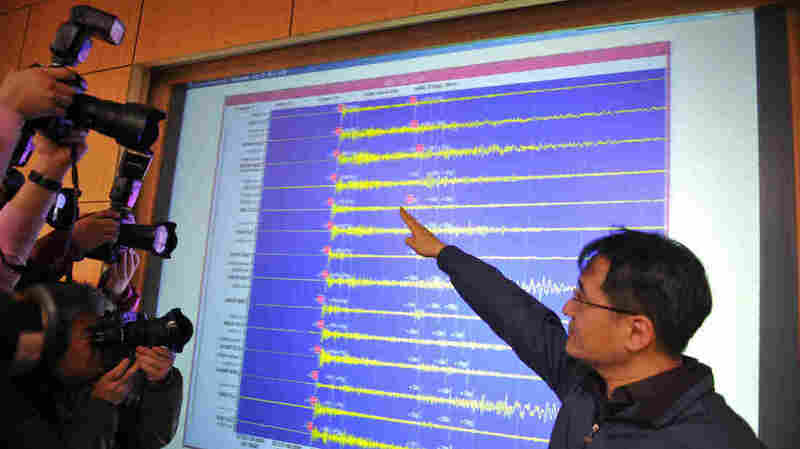 North Korea's latest nuclear weapons test is much more powerful than the previous two, according to estimates made by instruments that measure seismic waves from the blast. But it's hard to verify North Korea's claim that the test was of a miniaturized nuclear weapon. "It doesn't do the North Koreans much good if they have to put it in a truck," says Jeffrey Lewis, the director of the East Asia Nonproliferation Program at the Monterey Institute of International Studies. But the threat level obviously rises as the bombs get more compact. And that's the claim with the North Korean nuclear test. "KCNA, the Korean news agency, has come out and said it was a smaller and light design, I believe were the exact words," says James Acton, a senior associate in the nuclear policy program at the Carnegie Endowment for International Peace. It may be possible to glean more information about that claim if gases from the underground test have escaped into the atmosphere. Sniffer aircraft scoop up air samples that might be used to learn more details about the design of the explosive. "Even if it's possible to infer some design details, any conclusions are only likely to be fairly tentative," Acton says. "So although I think it may well have been a miniaturized device, we actually may never know." The United States undertook hundreds of nuclear tests before developing reliable small warheads. But Acton says the North Korean program has been designed from the start to produce a compact weapon. That means it could have made real strides, even though this is just the third test. "There's also the possibility that the North Koreans have received outside assistance. That could make their task of creating a miniaturized warhead easier," he says. Even if North Korea has produced a compact warhead, it doesn't yet have the ability to strike the United States with a nuclear-tipped intercontinental ballistic missile. North Korean engineers have launched missiles into space, but Acton says so far they haven't shown that they can build a warhead that is rugged enough to re-enter the earth's atmosphere at hypersonic speeds and blistering temperatures. "Not only do you have to have a weapon that's light enough to fit in the nose cone and small enough to fit in a nose cone, you also have to have a re-entry vehicle and design combination that is durable enough to survive the rigors of re-entry," Acton says. Even so, North Korea may have the ability to threaten its neighbors with a warhead on a shorter-range missile, which moves more slowly and can carry a bigger warhead. "Some of the missiles that they have — the shorter range missiles — they might only be looking at a payload of about three feet, in which case we'd have to believe that that's doable," says Corey Hinderstein, vice president of the international program at the Nuclear Threat Initiative. As things stand, the nation could build a handful of weapons. North Korea is apparently no longer producing plutonium, and there's probably enough on hand for about a dozen warheads. Some of that plutonium could have been used in the latest test. But there's another possibility. "The real interesting question is whether this used highly enriched uranium," Hinderstein says. It's harder to build a compact nuclear warhead with uranium, compared with plutonium, but it is possible. And uranium can be enriched in secret. No reactor is required. "At least publicly, they have declared that they are not producing any highly enriched uranium for nuclear weapons — that all of their interest in uranium enrichment has been in support of their nuclear energy program," Hinderstein says. So if the sniffer aircraft detect a uranium bomb, that would be a very significant finding about the North Korean nuclear program. "It doesn't necessarily change their capability, but it may change the number of weapons they could have at their disposal in the near future," Hinderstein says. It's nothing to panic about, she adds, but clearly with each advance the situation becomes more uncomfortable.